Security Cameras for Home and Business in Florida & West Palm Beach Area. We have the solution you need for your home or business, for indoor or outdoor with remote viewing from anywhere using your smartphone or tablet. From 1 Camera to 128 Cameras System. Professional quality equipment and white glove installation. We are license and insured. All installed equipment comes with warranty. to design the best solution to fit your security needs. Security cameras are important today for your home or business! Why do homeowners and business owners want a security camera today when they have alarm systems available to them? The main reason that security cameras are in such demand today is because they provide a video image of what is occurring in that cameras field of view. Not only does it record but one can also watch live from you your home and business or while you are away from the property. 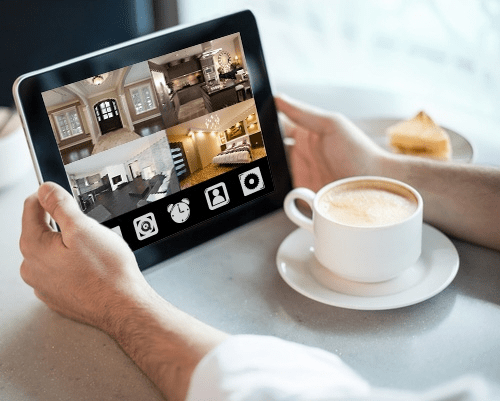 TechnoLiving offers easy ways to access your security cameras at any time of the day or night by viewing live through your smart phone or tablet. A security camera system basically consists of a determined number of cameras required to secure and cover a designated area of a property either indoors or outdoors or both. It also requires a digital video recorder to record the cameras, and the wiring and wiring terminations to connect it all together. Your choice for each camera in your system will depend on whether you want to install it inside or outside, area you need to cover, the resolution (the higher the resolution the clearer the image), the mount type (do you need to mount it on a wall, ceiling, pole, etc.) and of course, your budget. Are you concerned with night vision? Infrared LED technology can illuminate an area in the cameras field of view. What kind of image quality are you expecting in the pictures? Do you want to be able to read a license plate number should a car be parked at a visible angle in your driveway or front of your house or business? How much area do you expect the camera lens to cover? Do you want a wide angle security camera lens to cover a much broader area? Do you want a 180 or 360 degree view through the camera lens? How much storage do you want recorded on your recorder? Someone is much less likely to try to break the law, lie, or steal from you if they know they are under video surveillance. If a potential thief is casing the neighborhood for a good place to hit, they are going to avoid houses with security camera surveillance. Neighbors are less likely to peek at your mail or let their dog go on your lawn. Conversely, people are more likely to be on their very best behavior when they know their actions are being recorded. There is no better evidence in court than a good quality surveillance video to help prosecute or defend a case. You’ll want to make sure your Digital Video Recorder (DVR) is set up for date and time stamping. It will be much easier to get a restraining order against someone if you can show on video that you’ve been threatened or your property has been trespassed. Nothing is more frustrating than knowing who committed a crime against you but not having the evidence to prove it. A security camera system can help prevent that situation. Playing back recorded video on your security camera system can help resolve all kinds of questions and issues. For example, if your lawn, car, or mailbox is being vandalized, a security camera system can help figure out exactly what is going on. Nighttime vision and varifocal lenses are readily available now so that you can capture a good video day or night and at varying distances. Perhaps you suspect that your property is being trespassed but you’re not sure. Security cameras can help to find out. Motion detection technology, which is standard on most DVRs, helps with this scenario by narrowing down the video that you need to view. Security camera systems can help with smaller questions too, such as whether you remembered to close the garage door, if the kids are home from school yet, or who left those toys all over the driveway. Good quality security camera systems are much more affordable these days than they used to be. In the past a home owner would have to choose between a quality system and an affordable system, but no more. DVRs and cameras are much better quality than they were five years ago and at a fraction of the cost. Video and audio files tend to be very large, but data storage and high-speed bandwidth are readily available and affordable now. Portable devices such as IPhones and BlackBerrys provide access to the security camera system like never before. Nothing beats the peace of mind that you can get from being able to view your home or vacation property when you’re not there. You can confirm that your teenagers have arrived home from school safely. You can check and see that the baby and the sitter are doing fine. A surveillance system is a great backup to a home alarm system. If the alarm goes off, a quick remote look at the camera system can tell the home owner if the alarm is real or false. It can also prevent you from dispatching the police and incurring a fine if the police are called to your home for a false alarm. So… Do you think you need a security system? If you buy the cheapest equipment on the market you are more likely to have poor image quality. Not having enough cameras or a poor camera system let the crook get away. The trouble is that homeowners often do not have the internet upload speed to support real-time viewing remotely. The name “wireless camera system” is somewhat misleading because although you don’t need wires to transmit the video you still need wires to power all of the components. So, wireless systems do not solve all of your cabling dilemmas. 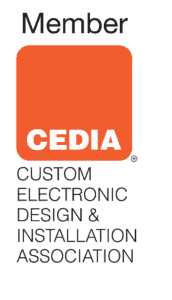 can help you to design the best solution for your needs.